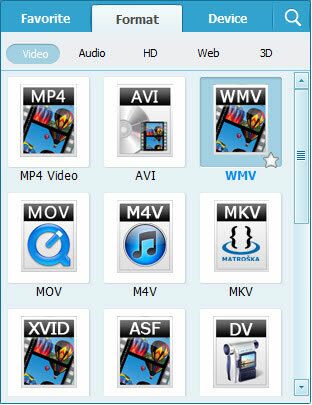 Before we start the question of how to convert WMV to AVI let’s see why it is necessary to convert WMV? Originally, WMV was used for internet loading and installing material. Earlier editions were based on MPEG-4 Part 2 but the newest edition (WMV10) uses Windows own video development technology instead. Unfortunately, some separate Video and DVD players, especially the old versions, do not identify WMV. Currently, the more commonly used structure is AVI. It is a package structure also designed by Microsoft Company for Microsoft multi-media structure. However, in comparison to WMV and MPEG-4, AVI is a much old structure, which does not have some functions found in container that are more recent. One benefits of AVI is that it can be designed with no pressure. The effects of this uncompressed AVI are that there is no loss of quality from the feedback video to the stored computer file. Hence, many people may want to convert WMV to AVI format. 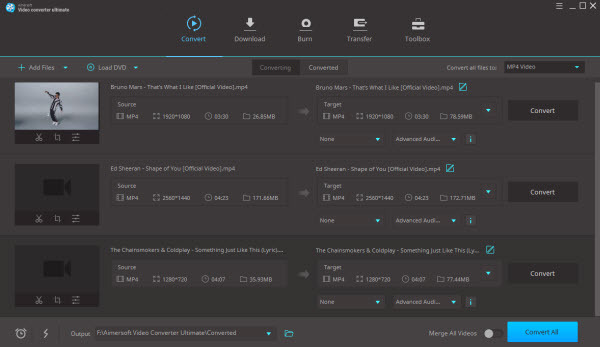 Aimersoft Video Converter Ultimate is an excellent program that is value every individual cent. I would happily and strongly, suggest this software for anybody who does much movie conversion because it will do all you need. Suports converting WMV, AVI and more than 250 formats. Offers 175+ ready presets for various devices, like Surface, iPhone, etc. If you have a 4th Gen processer with 8 cores then it is even quicker. It runs easily, only with 3 simple steps can you finish the conversion. The result of conversion is excellent, absolutelt zero quality loss. As an multi-functional video converting tool, Aimersoft Video Converter Ultimate can convert not only WMV files to AVI, but also able to convert virtually any video/audio formats like MOV, MKV, FLV, SWF, ASF, MP4, MPEG, WebM, DivX, XviD and more. Besides, it is able to edit the video to fulfill your needs to create special video enjoyment. After converted the videos, you can directly use this software to burn the videos to DVD with customized DVD menu and don’t need to search for some other DVD burning tools. If you want to convert WMV format to AVI on Mac, you can have a try on Aimersoft Video Converter Ultimate for Mac. This WMV to AVI converter is fully supported by Mac OS X (10.9 Mavericks and 10.8 Mountain Lion). Apart from transforming WMV files, you can download online videos with it from various video sharing sites like YouTube, Metacafe, Hulu, VEVO, Vimeo and more. Follow the simple steps below to have a try on Aimersoft Video Converter Ultimate. I believe it will surely satisfy your needs. Install this WMV to AVI converter on your windows-based computer. Double click the app icon to run this program. To import the WMV files, you can click "Add Files" to select and load the files you want or directly drag and drop the files into the window of this program. Click the pull down arrow near the Output Format option and choose AVI as the output format from Video Format category. Click “Settings” on the bottom of the windows, you can set the output video quality, audio encoder, resolution, channel and more. Tips: Click the Edit icon on the right side of the loaded files to open the editing window. You can trim the video into small clips, adjust the video effects, crop the frame size, add watermarks and load subtitles to the video. When all settings are done, just click the big blue Convert button to start the conversion. And your WMV videos will be converted to AVI format automatically. You will get the output files in a few minutes from the output folder which you have designated or the default one. Install this WMV to AVI converter on your Mac. Simply double click on the application icon showing to Mac. To import the WMV file, you can just click “+” or "Files > Load Files" to select and fill the file you want or directly move and drop the file into the window of this converter. Tips: Simply click the Eidt icon on the right side of the file to open the modifying window. You can cut it clip into small size clips, add watermarks and load subtitles or crops the size. Choose AVI as the outcome format from Video Format classification. By clicking "Settings" on the right top of the icon, you can customize the format codec, like bit rate, frame rate and more. When all configurations are done, simply click the Convert button to begin the transformation. And your WMV videos will be transformed to AVI format instantly. When we compere WMV vs AVI we see both of these types are "containers" for movie, and because of that, you should consider what you put into them. It is more essential what codec you use to scribe your movie or video. Your WMV is likely to be an ASF package with, but with the codec set to Microsoft codecs to sue. The query now is which codec to use. DivX may be a great choice. If you are using a non-Microsoft codec, you should not create a computer file known as WMV. This might be avoided by application anyway. WMV is an edition of the ASF structure. Often AVI is chosen to use other codecs, offering all your viewers have the codec you are using. Which structure you choose and what codec to use is determined by what you want to do with it clip. If you want individuals to perform it, clip in press gamer it might be a concept to use a Microsoft codec. This sounds like a really good program to test out. I like the fact that you can edit them as well, which will be nice if you have some great video but it needs to be tweeked a bit. I will be sure to use this method to convert WMV to AVI . Good software to convert wmv to avi format nad I can use it on Windows, really is faster that other converters and keep high quality. Thank you!